Welcome To My World. Doing All Those Things I Thought I’d Never Do Again. 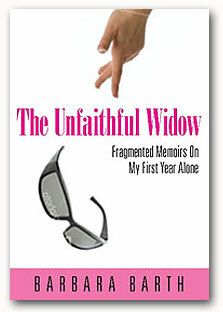 The Unfaithful Widow is a collection of essays and fragmented thoughts on finding joy again after the loss of a mate. A memoir of the first year alone written with warmth and laughter, no subject is taboo. From dealing with the funeral home (Can I show your our upgraded cremation package? I looked at Miss Death, was I booking a vacation?) to dating again (He ran in the door, looked at me and said “I’ve left something in my car.” He never returned). Sprinkle in a bevy of rescue dogs (Finally a good nights sleep with someone new in my bed.) and those questions you hate to ask (Condoms anyone?). A story for anyone who has suffered loss and is determined to become their own super hero. The Unfaithful Widow will make your heart ache while tickling your ribs. A deeply heartfelt, candid memoir about rediscovering the joy of living in the wake of death. This book is a testament to love and the emergence of an original voice.” –Philip Nutman, critically acclaimed author of Wet Work and award-winning screenwriter. Join Barbara as she takes you on a year's journey to find a new life for herself after her husband’s death. Funny, endearing and full of hope, her experiences will make you laugh, bring a tear to your eye and make you shout, "Go Girl" as she reinvents herself as a creative single woman. More than a widow story--this tale is for anyone rediscovering themselves...Patrice Dickey, Your Guide to the Life You Love, and the award winning author of "Back To The Garden: Getting From Shadow To Joy." I have always hated the word Widow. It conjures up the bleakest of images for me. The word makes me think of an old woman, cloaked in black, alone, an empty shell of a person that once was full of life. Now I am that woman who is a widow. I look in the mirror. Do I know you? You seem vaguely familiar. Then the face turns and I realize it is my face. That brings a little smile to my face. Good friends lie to you when you need it. The day I went to see the probate attorney was the day I decided to pull myself together. I wore an ankle length black skirt and T-shirt. I was decked out in my chunky turquoise necklaces and bracelets. I wore my Mary Jane canvas shoes. I sprayed perfume around my head and walked out that door. Two hours later I left the attorney’s office too depressed to go home. So I headed to the antique shop where I have my booth. It seemed the closest and friendliest place I could think of. “We’ve never seen you in a skirt,” the gal behind the counter remarked and actually clasped her hands in glee. Now there was someone who could perk you up. “Just back from dealing with the will,” I replied and made a sad face. Then I did a full curtsey, dipping and holding out my long skirt. “I am hip, aren’t I?” I looked straight at her. She’d better answer that one right. “The hippest.” She grinned at me with that remark. She was forty-five, skinny and lived on the edge. I was the sixty-year-old widow. Now that is an image I can start to live with. Single again at sixty, Barbara loves to write about the new life she created after the death of her husband. Her book of essays on finding joy again began a journey that is still moving her in ways she had not expected. She is an author, shopkeeper, and, as she likes to kid, dog whisperer. December 2010, she launched a one-issue dog magazine, "Writer With Dogs: Where Dogs Meet Art". Three days later, she found a tiny building for rent in a historic district in a nearby town and opened The Little Shop Of Arts And Antiqueswhere she sells small vintage gift items and hosts the Gwinnett County Writers Guild. The shop has local author book signings and writing classes. Barbara is a member of The Dog Writers Association of America, The Atlanta Writers Club, and writes featured posts on Silver & Grace, Skirt.com and Lifetime Television's, The Balancing Act. Living with five rescue dogs makes every day a circus! Be sure not to wear black if you visit! Of all the thoughtless things my darling husband did over our years together, leaving me a widow three months before I turned sixty was the worst. While I was overcome with grief, a tiny part of my brain realized I would go into a new decade by myself. And it wasn’t any decade; it was the one that labels you old to others. I didn’t mind getting old with him, but, gee, being old by myself was not in my game plan. Add to the mixture I was retired from my job with the federal government, we never had children, and I basically had nothing to do except play with my antique booth at a local shop once a week. I decided I needed to snap into action to save my life, or stay glued to the sofa he died on. Within the first three months of gaining my widow crown, I purchased a vintage Corvette and joined an online dating service. I had no real desire to meet men, but I needed to get out of the house. My girlfriends were all married, and while they were by my side during the day, they were home with their husbands at night. My nights were empty except for my two dogs and my computer. Most evenings, in those late night/wee morning hours, I shot e-mails to my friends. Pitiful little missives about being alone. Then I would turn on my music, sing to my dogs, and my spirits lifted. A second e-mail message was sent with only two words, never mind. My friends never mentioned those e-mails to my relief. I decided I needed to gain more control and started writing a personal journal. The e-mails stopped. Within a few months I found I loved to write. What started as a way to clear my mind became a path for me to discover a new life for myself. That was over four and a half years ago. I have left the widow crown behind. My business card reads “Writer With Dogs” since I live with six dogs from my local animal shelters. My new crown says Crazy Dog Lady and I wear it with pride! For a gal who never liked change, I had to deal with the biggest change of all when my husband died. I hope my book helps others deal with loss. Writing saved my life and gave me purpose. Most days find me at my computer with my dogs by my side. I did not have a writing background, but created a world where I write every day. I am working on my second book of life stories. I love for others to like my writing, but for me, it is still cheaper than therapy, better than drugs, and with any luck, it will replace my hunger for Mexican food so I can focus on my diet. But that is still open for debate. Keeping a journal is one of the best things you can do for yourself. It is a record of your thoughts and life’s journey. You don’t have to write much, but pin down your emotions. I find that going back and rereading what I’ve written helps me gain perspective on what I need to do next. Writing, and a little help from signs from the universe, keep me forging ahead to my next adventure. A brave woman to share her journey back to "life"....had to be hard. Thanks for sharing her post with all of us!